prior to the turn of the century and millennium. when January 1, 2000 came. Well, the moment came and passed with little problem and big relief. with financial and economic, political and social changes occurring faster and faster in recent years. The 2000 election of George W. Bush was muddled by chads and miscounts. He gained the Presidency by a hairsbreadth in the Electoral College, 271 to 266. Al Gore had won the popular vote. For a month, the nation wondered and worried about the outcome of the election. Many citizens of the USA and the world have continued to wonder and worry for 8 years. 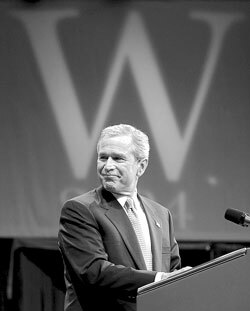 Still, it seems clear that GWB was ordained to be America's 43rd President. He is the product of a "dynasty" going back centuries, in some ways to George III. Mr. Bush was "the RIGHT man for the time"
to bring America into the present pivotal period in history. His Sun is in 12 degrees of Cancer, less than a degree from that of the USA. America's natal Sun is placed in Bush's secretive, dark 12th house in a comparison chart. What do we and the new president have to look forward to? Is this the darkness before the dawn? The 2001 destruction of the World Trade Center was a major catastrophe for the USA and the world. Structurally, financially and in fundamental human terms. However behind the obvious pain and suffering lies the symbol of FALLING TRADE AND COMMERCE. when rampant aggrandizing materialistic capitalism will tumble to the ground. the explosion of Space Shuttle Columbia on re-entry from a mission was saddening as well as spooky. Seven brave and talented Americans lost their lives endeavoring to further scientific explorations. But, the Columbia Disaster was, again, more than an isolated, passing trauma. Columbia is another name for America. as we claim Columbus discovered the New World. 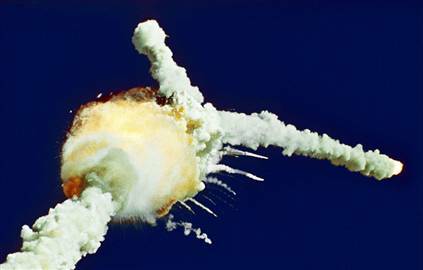 So, another picture of America is exposed as the Shuttle Columbia explodes and falls from the sky. A pattern may be emerging here. Mother-in-law used to say, "Dress for success." Paul Wolfowitz, President of the World Bank, should have listened to Mom. But, it takes more than a suit and a pair of socks to hold up appearances. 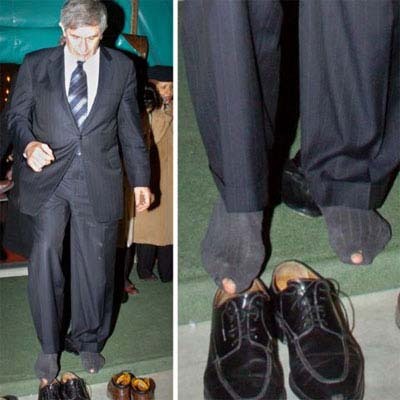 Wolfowitz was caught on camera with holey socks at a mosque in Turkey in 2007. Paul may just be careless about his own clothes and finances, but he was The President of the World Bank. Wolfowitz might have had the resources to stop at Walmart for some extra socks for such occasions. But, one has to wonder if there isn't more to this picture than meets the naked eye. Maybe Paul was sending us hints about the state of world finance. as it took off from LaGuardia Airport on January 15, 2009. Within seconds, the plane's engines quit. 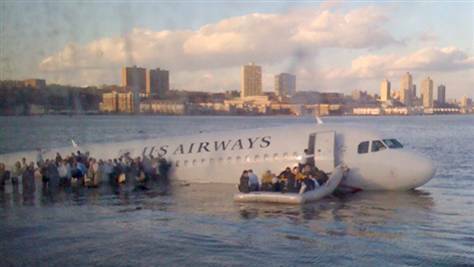 Within minutes, Captain Sullenberger ditched the aircraft safely in the Hudson River. No major harm came to the passengers, but the "ship" may take a long time to get back in the air. The incident occurred just days before the inauguration of the 44th President of the USA. 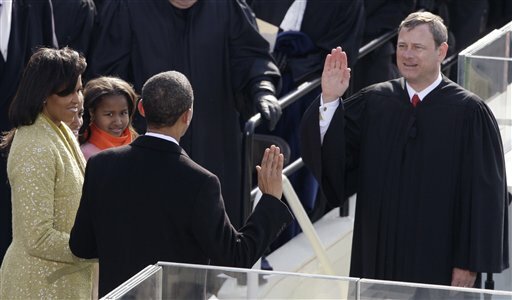 Whatever the cause, the new President misspoke his inaugural oath on January 20, 2009.
made a special trip to the White House the following day to take Mr. Obama through the process again. So, was President Obama's administration birthed on the 20th or 21st of January? we can expect Mr. Obama has his work cut out for him. The opening miscue portends difficult days ahead, to be sure. Our prayers and support are needed.